The CleanFinancial.com guide to spread betting on Barclays shares. Where Can I Spread Bet on Barclays? Where to Trade Barclays Shares for Free? Where to Practice Trading Barclays Shares? How to Spread Bet on Barclays? CleanFinancial.com readers should note that you might also be able to trade Barclays on other platforms. Where Can I Find Live Prices and Charts for Barclays? The real-time CFD trading chart below provides users with a handy view of the Barclays market. The Plus500 chart that we use above typically uses the Barclays futures market (not the spot price). To look at real time financial spread betting prices/charts for Barclays, you will normally require a spread betting account. You can also use a spreads account to speculate on shorter term spot markets. 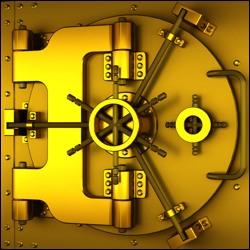 Opening an account is subject to credit, suitability and status checks. Should your application be approved then, when you log on, you will be able to view the prices and charts. These are normally provided as part of the service. The catch? You are likely to get the odd sales letter or call from your chosen online spread betting provider. If you do trade then, before starting, you should note that spread trading and CFDs do carry a high degree of risk to your funds and it's possible to lose more than your initial deposit. See below for more on advanced Barclays charts. The UK stock is lower than the 20-day MA of 190.1p and lower than the 50-day MA of 194.8p. Price data from Google Finance. 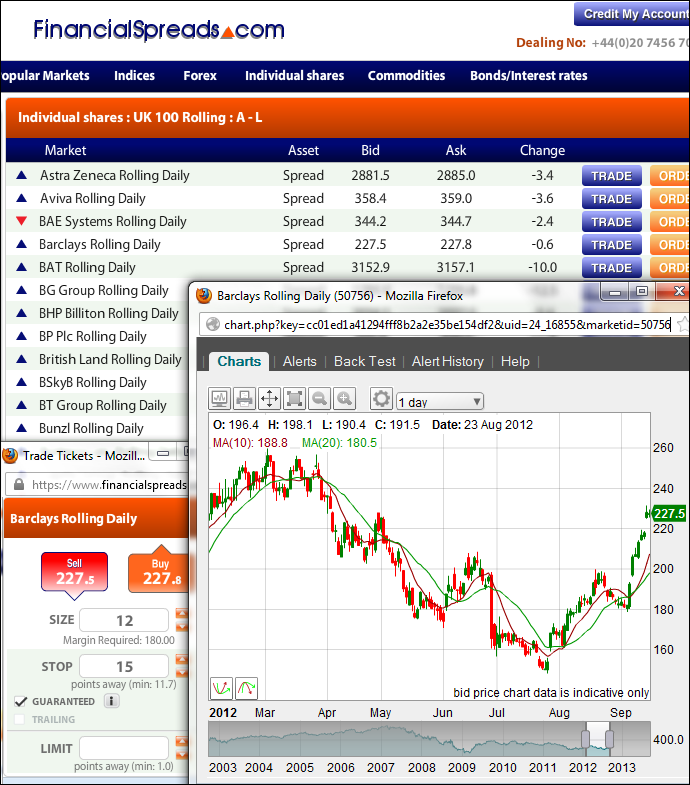 Also see Live BARC.L Share Price & Charts and About Barclays for more information. In this technical analysis video, Trevor Neil, from BetaGroup, talks to IG about using the RRG function to analyse European sector movements. The video also discusses why Barclays might be a useful way of speculating on the performance of the FTSE 100 index. A variety of time periods - 2 minutes, 30 minutes, 1 day etc. Key chart overlays - Parabolic SAR, Ichimoku Kinko Hyo, Envelopes etc. A wide selection of secondary charts - Elder Rays, Relative Volatility Index, Forecast Oscillator etc. Advert: Barclays Spread Betting, sponsored by FinancialSpreads.com. You can spread bet on Barclays with Financial Spreads. Where Can I Spread Bet on Barclays for Free? By its very nature, speculating is not without its risks, but if you would like to try a (free) Demo Account, that allows you to try spread betting on a host of markets, see below for further details. When thinking about which trading option might work for you, also remember that spread betting in the UK is currently tax free*, i.e. it is exempt from capital gains tax, income tax and stamp duty. Each of these spread trading companies currently offer a Demo Account which lets users practice with orders, test new trading ideas and check charts, such as candlestick and line charts. If you are going to speculate on UK companies such as Barclays then one possibility could be to place a spread bet on the Barclays share price. When financial spread trading on UK equities you trade in £x per penny. As a result, if you risked £5 per penny and the Barclays share price changes by 24p then that would change your profits (or losses) by £120. £5 per penny x 24p = £120. One thing to note is that this is a Rolling Daily Market which means that there is no set closing date for this market. As a result, if your trade is still open at the end of the trading day, it will roll over to the next session. Then you may buy a spread bet at 243.8p and risk, for the sake of argument, £10 per penny. Therefore, you win £10 for every penny that the Barclays shares move above 243.8p. Of course, it also means that you will make a loss of £10 for every penny that the Barclays market decreases below 243.8p. Considering this from another angle, if you were to buy a spread bet then your profit/loss is worked out by taking the difference between the final price of the market and the initial price you bought the spread at. You then multiply that price difference by the stake. Speculating on equities, by spread trading or otherwise, can fail to go to plan. In this example, you had bet that the share price would go up. Nevertheless, it might decrease. If the Barclays share price had fallen then you might choose to close your position in order to restrict your losses. Note - Barclays Rolling Daily spread accurate as of 17-Oct-12. Below, an older but useful case study on the Barclays share price by Shai Heffetz, InterTrader, 25-Oct-2011. Three months ago, at the end of July 2011, Barclays was still trading at close to 240p. Since then it has taken a rather sharp nosedive and, at one stage, the share traded at well below 140p. Looking at the chart below, we can see that the Barclays share price was just below 240p towards the end of July. At that stage the 10-day Exponential Moving Average was already somewhat below the 20-day level, showing us that the share was in a bear phase. After that, the 10-day EMA remained well below the 20-day EMA and the price dropped consistently, except for a few instances where the bulls tried in vain to push the price up. At the beginning of September, it dipped below the 140p level for the first time, followed by a concerted effort by the bulls that momentarily saw the price rise above the 20-day EMA. Then it dropped below both moving averages again and also dropped below the 140p level again, at which stage we see a classic hammer pattern forming. Since then the spread betting price has failed to form a new low. By the middle of October, it had in fact moved above the previous high we saw round the end of September. Currently, the UK bank’s shares are trading above both the 10-day and 20-day EMA. The 10-day EMA has also broken through the 20-day EMA line for the first time, which is another confirmation that we are seeing a mini bull run. Whether this will last remains to be seen. Fundamental factors, such as the Euro debt crisis will no doubt play a role here. Having said that, technical analysis suggests that any close above the 190p level could indicate, at least in the short term, a continuation of the bullish market. Barclays spread betting and trading guide with live BARC prices and charts. Plus, daily updates, broker recommendations on Barclays, where to spread bet on the UK shares tax-free* and commission-free, how to trade... » read from top.